We highly recommend that you consider an internal process whereby a small number of Admin users (between 2 and 5) are set as designated support contacts, and all iCarol questions, requests and issues are forwarded to these Admins first. You will likely find that some of the questions, requests or issues can be addressed without the need to escalate the issue to the iCarol support team. 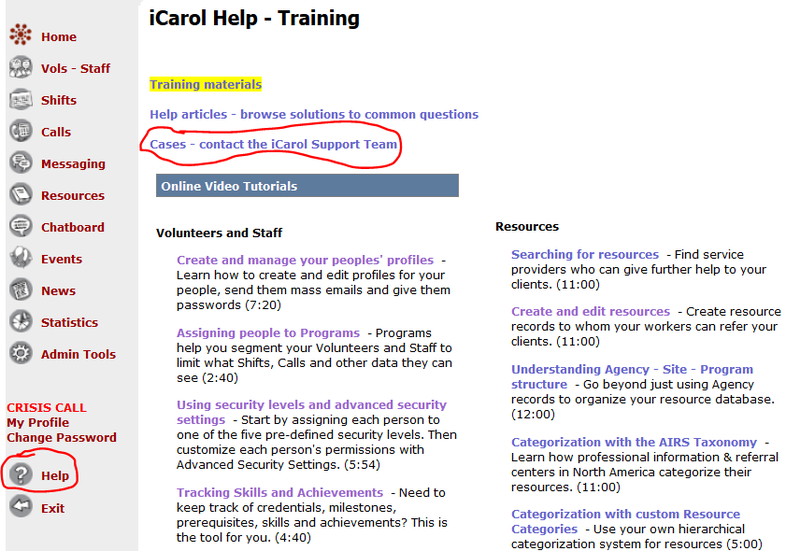 For example, it may be that someone just forgot how to complete a particular task in iCarol, and the Admin can provide instruction. 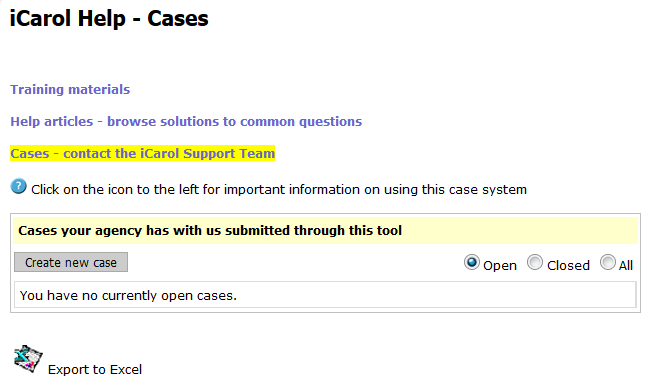 If the Admin cannot answer the question, fulfill the request or address the issue, they can then submit a case to the iCarol Support Team using the online case management system. At the top, you will see a blue circle with a question mark; click on this for answers to common questions about the case management system. On the right hand side of the screen, you will see three filters; Open, Closed, and All. You can use these filters to filter which cases will display on the screen. You will also see an Export to Excel icon at the bottom of the screen. You can click on this icon to export the list of cases you have displayed on the screen. Just as in other places in iCarol, red asterisks indicate required fields. The first required field is the subject field. As indicated in the screen shot above, please give a clear, concise and descriptive subject, and avoid generalizations. For example, “iCarol issue” is not a good subject. “Cannot edit Caller Profiles” is a good subject. 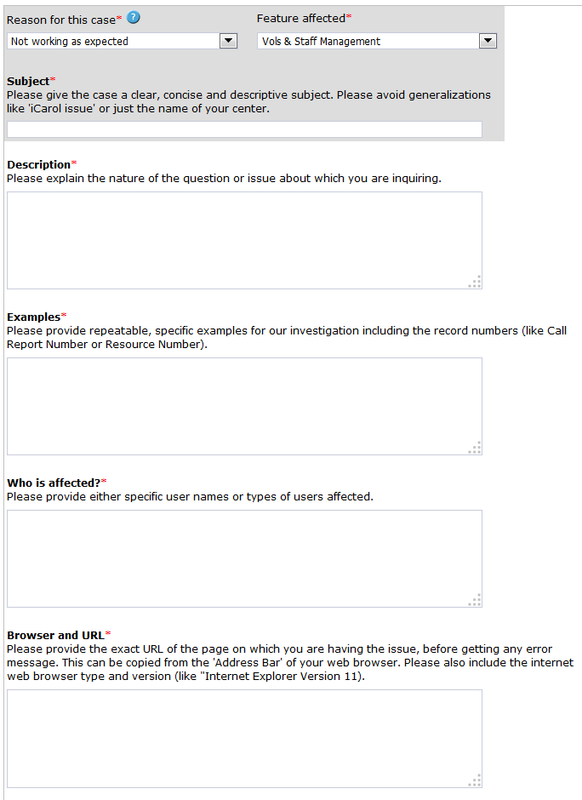 Regarding the other fields as seen above (Description, Examples, Who is affected and Browser and URL), please fill in the text fields with as much detail as you can regarding the question, request or issue you are submitting. Also, screenshots or other documents that illustrate the issue or provide further detail or explanation about your question or request are extremely helpful. 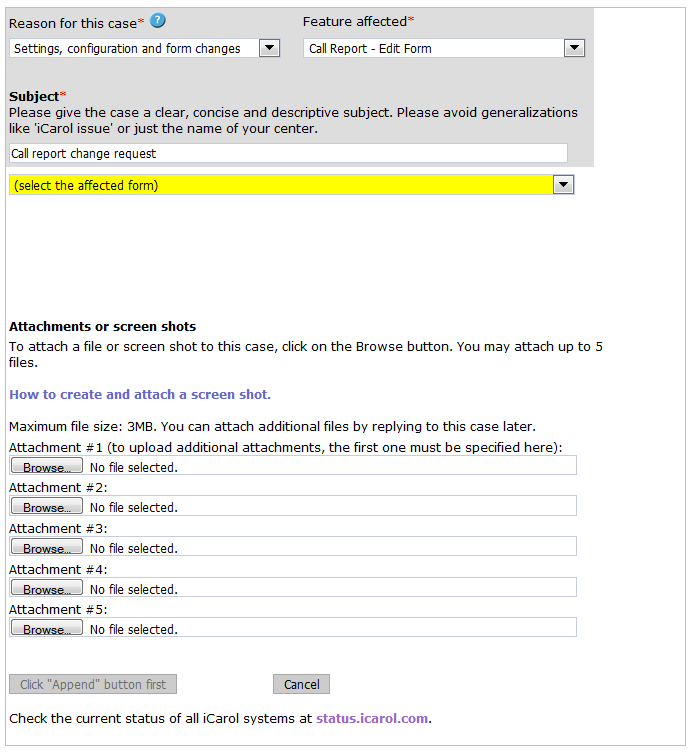 You can attach up to five documents to your case via the “Attachments or screen shots” section at the bottom of the case submission screen. 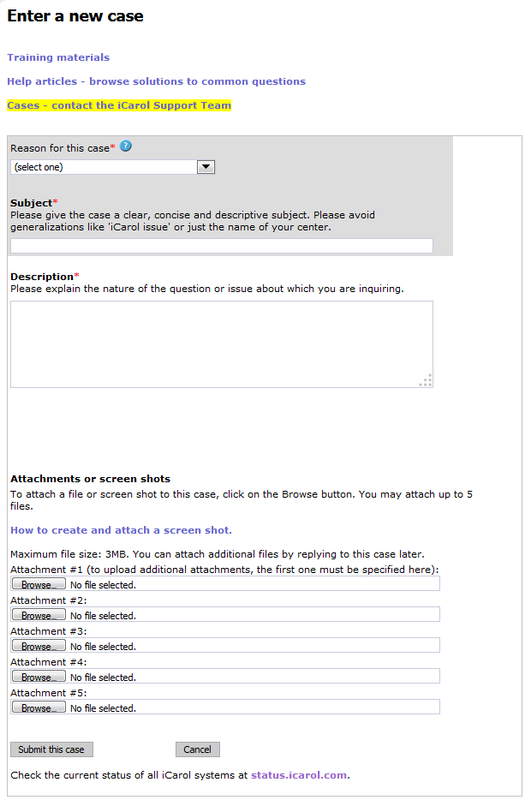 Please note, you cannot paste screen shots into the text fields on the case submission screen. They must be saved as a document onto your computer, and then attached to the case. The more detail you provide when submitting a case, the easier it is for the support team (and technical team, if the case relates to a technical issue) to understand your case, complete a thorough investigation, and reply in a timely manner. If we require further details, this might delay resolution of the issue as we gather additional details from you. It is truly in your best interest to supply as many specific details as you can so your case can be addressed efficiently, effectively and quickly. If you have a large list of edits to be made, you can also attach a document that outlines these changes. 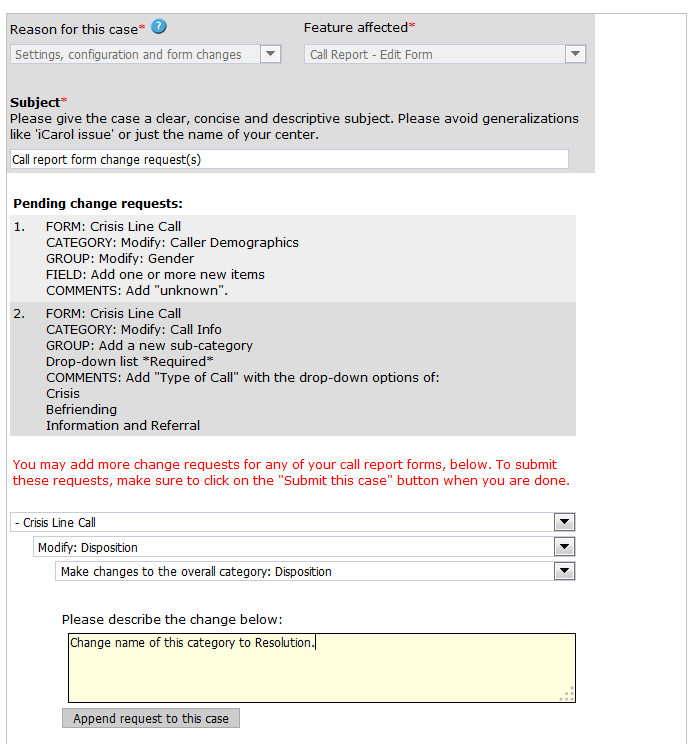 We request that the document include the same specifics that the case submission tool does, namely, that you indicate clearly which call report, categories, groups and fields need to be edited. As always, if you have any questions, please do not hesitate to contact the support team!